Time with a good friend can be just as beneficial as a good therapy session, especially when you cover serious mileage during that time. So lace up those shoes and get a different kind of therapy on! I hate the side cramps, the shin splints, and a weird metallic taste in my mouth when I push myself too hard, which usually happens within five minutes of leaving my house. That said, I’ve run two half-marathons and half a dozen 5K’s in the past three years. Why? Why do I do something that I vehemently hate? Because ... I love my best friend. My best friend loves running. She gets runner’s high from a short jog. Last year, she signed up for a half-marathon and half way through, thought, “What the heck?” and finished the whole marathon because it was “fun” and “felt good”. (Picture me doing air quotes around those words). I admire her. She’s my BF, and I want to support her. So when we were roommates, several times a week we’d wake up at 5:30 a.m. and go for a run. Or sometimes she’d wake up at 5:30 a.m. and I’d join her at 6:30 a.m. for her second lap around the park. The result was she ran three marathons and I ran my two halves. The latter is something that I like to throw into conversation at cocktail parties, “Oh yes, when I ran my first half-marathon…” I am absurdly proud that I ran/dragged myself through 13.1 miles. Not once, but twice. I would never have experienced this victory without my friend. I should mention that my friend struggles with depression. Running is part of her therapy. She feels more balanced, sleeps better, and even has better energy now too. Although I’m a reluctant runner, slipping on my running shoes helped me too. First, I am able to eat more carbs. Because I was running several days a week and biking to cross-train, I could slurp up as much spaghetti as I wanted. Yes, you may pass the breadbasket to me. And the olive oil. Don’t worry. I torched six hundred calories this morning. I now fall asleep faster than before my running habit. And I am amazed to see definition in my abs, despite the extra lasagna in which I indulged. I would never have done this on my own. I can have the best intentions in the world to get up early in the morning, but when my alarm goes off earlier than 7:00 a.m., my resolve melts faster than butter on a hot pan. My soft, snuggly pillow almost always wins. However, knowing that a friend was depending on me to meet her motivates my sluggish legs to kick off the covers and lace up my tennies. We’re busy people and sometimes it’s hard to carve out time for our friends. On mornings that were particularly hard, I’d push myself away from my pillow and declare, “I’m going to spend quality time with someone who makes me feel good about myself. Take that snooze alarm.” (I may have used some stronger language in the early morning). Having a friend on the run also helped me stretch myself. My bf is faster than me. Her encouragement, or just seeing her ahead of me, kept me from sliding off the speed or just giving up and walking home. Because of our different paces, we actually ended up agreeing to a pattern of four minutes of running, followed by one minute of walking. During the four minutes, we’d kick it up a notch. Sometimes, I’d get caught up in the tempo and not notice how fast we were going. We made better times with our modified run/walks than if we just flat-out ran it. Because we ran together, I was introduced to a new lingo and community. I made new friends and learned tips about healthy eating. I used to make derisive comments and mutter, “Marathon runners are crazy,” when someone talked about training. But then some of those crazy marathon runners became my friends, and I began to understand different motivations that drive people to do what appear to be impossible things. 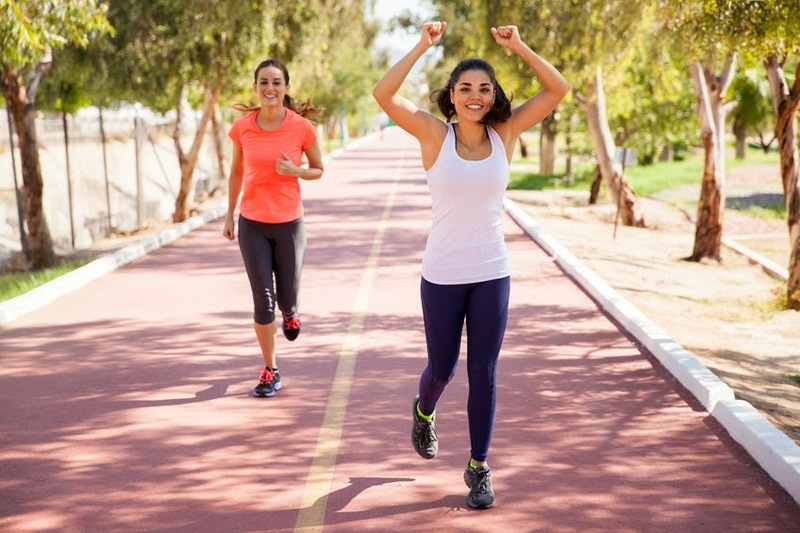 If you’re interested in starting running, check out these articles. If you’re not a runner, it’s okay. To be honest, since I’ve been married and my husband isn’t training for a marathon, I’ve been playing around with different types of exercise. My hubby and I go for walks and I meet up with a group of girlfriends for Zumba and yoga classes. The truth is that physical exercise helps reduce depression and anxiety. Researchers say that after just 25 minutes, your mood improves and you have more energy. 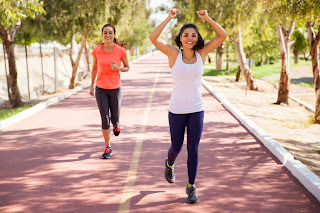 The director of the Anxiety Research and Treatment Program at Southern Methodist University in Dallas, Jasper Smits, says, “Individuals who exercise report fewer symptoms of anxiety and depression, and lower levels of stress and anger.” A "runner's" high, the delicious feeling of β-Endorphins released into our systems, can occur anytime that people engage in any strenuous exercise or activity, not just running. So, get off the couch, girlfriend! Schedule a time to walk around the block with a buddy. Go on a jog, dust off your bike, or take that new Jazzercise class that you’ve wanted to try. And then once you’ve tried it, we want to know, how do you exercise with your friends? What victories have you accomplished? Have you giving into running and given up your therapist?